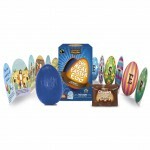 Out of the 80 million Easter eggs sold in this part of the world every year, The Real Easter Egg is the only one which has an Easter story booklet in the box, is made of Fairtrade chocolate and makes a donation to charity from its sales. The Real Easter Egg was launched in 2010. It was a real struggle as all the supermarkets turned it down at first. It was left to churches and church schools to place orders and fund The Meaningful Chocolate Company to begin making The Real Easter Egg. To date, we have sold more than one million eggs with 750,000 of these sent through the post directly to churches and schools. Not only has there been an increase in Fairtrade chocolate sales, but nearly £250,000 has been donated to charity. You can order directly from their website here.